From Donald Trump to Oprah Winfrey, the “secret” to success seems always to be ‘follow your passion.’ I, for one, always get lost with this directive. To me, it’s akin to telling someone to embrace their “freedom.” Okay, what the hell am I supposed to do with that? Passion is a loaded term. That soup of spiritual, emotional, mental, physical and social longing and satisfaction each have unique answers. The challenge is to bring alignment that satisfies all elements of your person. I’ve found myself chasing mental “passion” only to drain all energy from my physical body and vice versa. So what’s alignment? As noted in the post starting the “why” series, we have spent all of our lives growing up with the question, “what do you want to be when you grow up?” The real question is WHY do you want to be when you grow up? Below the surface of the what is a reason that drives you. 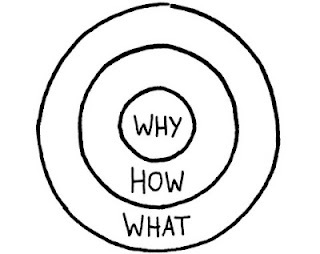 The alignment of the why, how and what are the critical recipe to figuring out the “passion” question. When I was 15, my deepest longing was to direct movies. I spent years in the theatre trying my hand at acting, directing, and a ton of time in the technical production. Other masters came into my life, and in the pursuit of their satisfaction I quashed the dream. Finally at 27, I thought the passion was to be a lawyer. I looked at the “what” of being a lawyer–power, money and success– rather than the “why”–helping people. I went down that ridiculously difficult road only to find that the inside of the what was different than the outside of the why. So, how do you get to the heart? Remove the “whats.” We spend a great deal of time–especially in our culture–driving to the features of our lives: what kind of clothes we wear to work; what kind of car we will drive; what kind of house we’ll live in. etc. These are all results or features, and they cannot drive the decision. What is the problem in the world that gets you excited? For me, after years of searching, I believe that people and organizations are uniquely situated to be incredible, but they don’t always see the path to excellence. What can you do better than anyone else to solve that problem? Again, for me, I believe that by spending time with people and organizations, listening to them, and bringing into focus the “thing” that really drives them, I am helping to unleash potential. There lies the WHY. My purpose or WHY statement is to unleash potential. The purpose should be boiled down to one or two words and be very simple. I want everyone to succeed mentally, spiritually, and emotionally in both personal life and in your professional life. This may mean that you are prepared for a job greater than I can offer. This may result in you becoming my boss. This may lead to alternate and unexpected employment. I will not make comment/criticism that doesn’t generate a positive result. I will never condemn you for something that I cannot change. Finally, what’s the what? At this point it is very easy to determine what you can do, but more importantly it determines what you can’t do. The realm of opportunity is limited by the answers to the preceding questions. So, it is easy for me to say based on my purpose and promises that I would not, for example, be satisfied as a scientist working in a lab all day because I would not be unleashing the potential of people. This is obviously an oversimplified approach. It may take months if not years to answer number two, but shifting the focus from the outside to looking inside is the start of the journey towards passion, er, purpose. Despite the difficulty of the journey, it gives greater meaning to everything in your life. Once you’ve identified the purpose, every action that you make in your life has greater meaning and significance. Suddenly, there is alignment between your actions and your goals, and then I would say, you can truly be passionate. This is without doubt one of the best posts I’ve read in ages, especially when it comes to the very subject matter of your words. Why? How? What? Before I even heard of Simon Sinek, and years before he was coming to his great understanding, I was working through these very ideas. As you may recall from my SoSlam spot begging for love, earning respect. It has to have a structure and strategy and tactics to be achieved. First, you vindicated me, I have a new e-book coming online in a few months that covers this information in depth, as part of a full parcel of Why’s to be faced to get the success we need. Second, it is so refreshing, and not often found, to see thinking like this take place. Too often too many follow the lists of the guru’s and run at them only to run out of results, and never know why? Your concrete example of using your own experience makes this resonate and much easier to understand the concept. Great post! Wow, Billy, I am so pleased with your comment! Thanks so much for reading my post. Your presentation hit me at the core because it hit on exactly the wonderful aspects of social media that first drew me to it. There is something beautiful about the revolution c.2008 that seemed like Tim Berners Lee’s vision of the internet was somehow coming to fruition. Once we start applying utility to it, however, that patina dulls. I am looking forward to your ebook and the future conversations that we will have to unpack this further. Thank you Kelli! I’m lucky to have you walking this idea journey with me, and I really appreciate the opportunities that we have to break these ideas down and make them applicable to others. I will come back here to follow your thoughts on this theme. Feel free to tweet to me, and I will chat through skype if you like. Monday Night is the best time to catch me in.